Shopping for Back to the Future Prop Replicas? Great Scott! Your very own Mr. Fusion! The device that turns garbage into energy! 18-inch electronic replica from Back to the Future Part II. 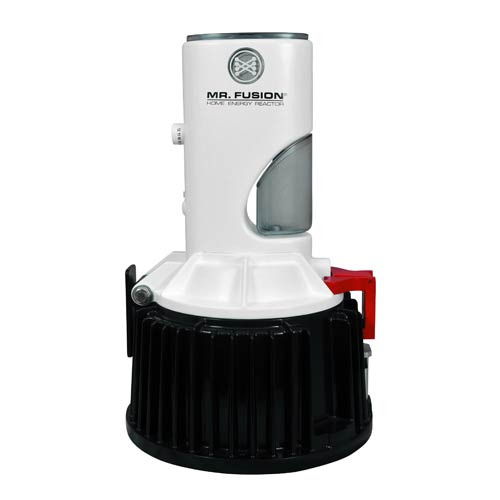 Get your very own Mr. Fusion, the device that turns garbage into energy! (At least in the movie.) Arguably the biggest technological leap between the 1985 we saw in Back to the Future and the 2015 we saw in Back to the Future Part II, the Mr. Fusion Home Energy Reactor is now a realistically scaled 18-inch electronic replica, complete with sounds to simulate the processing of household waste into 1.21 jigawatts of energy! 4x 1.5 AA size batteries. (batteries included) Ages 12 and up.